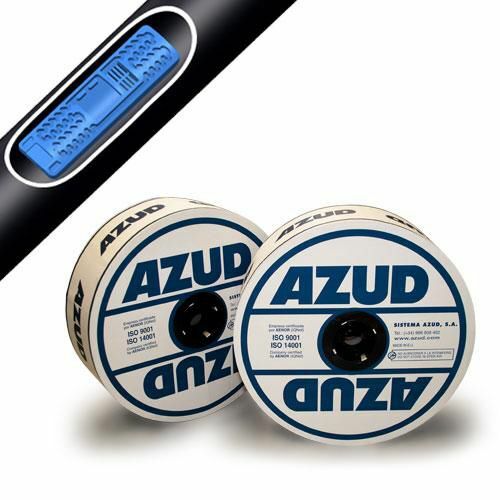 AZUD PRO is the success of the result of 25 years of experience in the micro irrigation sector. The use of the latest technologies and the innovative design criteria to the development of the new emitters have made possible the application in AZUD PRO of the “DS Technology” by AZUD, together with the obtaining of the maximum hydrodynamic efficiency and emitter’s reliability under all the possible working conditions. For irrigation in intensive crops. DYNAMIC protection system. The hydrodynamic design of the filter together with its wide filtrating area prevent the suspended particles in the water, being released into the dripper. LINEAL protection system. A suitable placement of the filter together with the flow directions allow the particles retained by the filter to be released when the water circulation speed increases in the emitter line, separating them from the filter and the dripper therefore protecting the dripline from clogging. This action is made effective at the beginning of the following stage of irrigation and during the cleaning of laterals.